Nigel Farage – Watch This Space! It seems that Nigel Farage is not just a beer-drinking MEP after all – he actually thinks about democracy, and the disconnect with the British public, and is proposing some measures to overcome the problems, which I find very reassuring. “The Ukip leader said that voters should be able to veto planning decisions, sack bad MPs and challenge council tax rises”. This is definitely the start of a move in the right direction. The Swiss system must be the envy of the world, as the people are regularly consulted on matters of importance. There is no other British politician that would contemplate such a concession! This has to be streets ahead of what we have now – which is absolutely nothing! Now its early days, I know, as the next election is in 2015, but the UKIP manifesto needs to be fleshed out. If this is an indication of where it will be going, I’m all for it. this is definitely a breath of fresh, clean air! There is a new petition on 38Degrees to try to get a usable “Recall” system working. I signed it, and was immediately asked to spread it around. 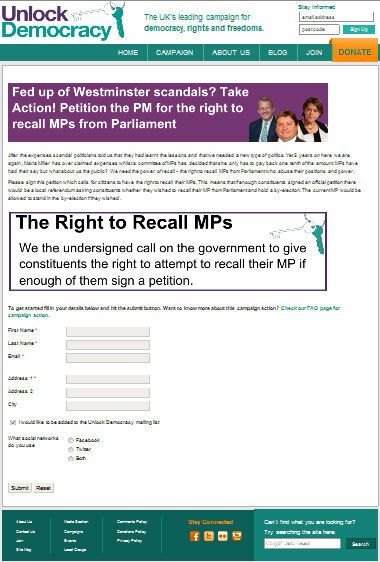 To be of any value at all, the Recall facility must be under the control of the constituency that votes an MP in. Cameron’s last attempt to fudge this demand by putting Parliament in charge was thankfully blown out. The recent election results have the major parties in a turmoil, and they will be amenable to making concessions in order to win back supporters. We need to use that advantage – strike while the iron is hot – and thrust as big a petition as we can possibly muster under their noses before complacency sets in and everything reverts to the status quo. “The government is making plans to announce new powers to sack – ‘recall’ – MPs who don’t do their job properly. But their plans could put the power to sack MPs in their colleagues’ hands – not their constituents. This isn’t good enough. Here is the link to the petition! Please spread the word as far as you possibly can!